We were thousands of miles from home on August 21st, 2017. We woke up early, of course. We’d prepared everything the night before, and we were quick out the door. As we began to hike up the peak in San Francisco, more and more people appeared. It was as if tributaries of humanity were converging on a path of pilgrimage. Families, children, travelers from afar. 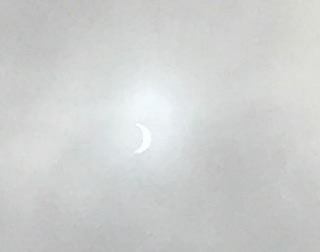 They carried their solar glasses in one hand, or (as in my case), solar binoculars, and steadily climbed higher and higher, glancing at the overhead cloud cover with worried but hopeful expressions. There was nervous chatter. As we went, we met one another and talked about our journeys, what had brought us to that one place. Waiting for that one moment that might never come again. For one family, it was the youngest’s first. But it was also the oldest’s first – and would be her last. For them, and for me, and for everyone, I hoped and wished with all my might. We made a nest upon a hill and stared out over the bay. Little by little, more people appeared, and the clock ticked on. The talking grew quieter. The glances more hopeful. The temperature dropped, and we knew less of the sun was reaching the land below. Behind those clouds – an eclipse was happening. We all raised our instruments to our faces, lenses shielding retinas. We held our breaths. Through a miracle of timing, a break in the clouds appeared when the moon was at its greatest across the sun, leaving nothing but a crescent sliver of light. A cheer went up across the peak, as every heart leapt in tandem. There it was. We’d done it. We’d seen it. In the following minutes, heavy layers of clouds made many of the glasses and binoculars useless, but some no longer cared. They simply looked upward, viewing quick and momentary glances at the dim crescent with unshielded eyes as the moon turned and continued its journey away. I thought of the old woman and turned to look. She wore a peaceful smile, her own unshielded eyes gazing steadily. It was more important to her. This moment. So important. It was to a lot of us.